Is glamping’s latest secret worth the search? 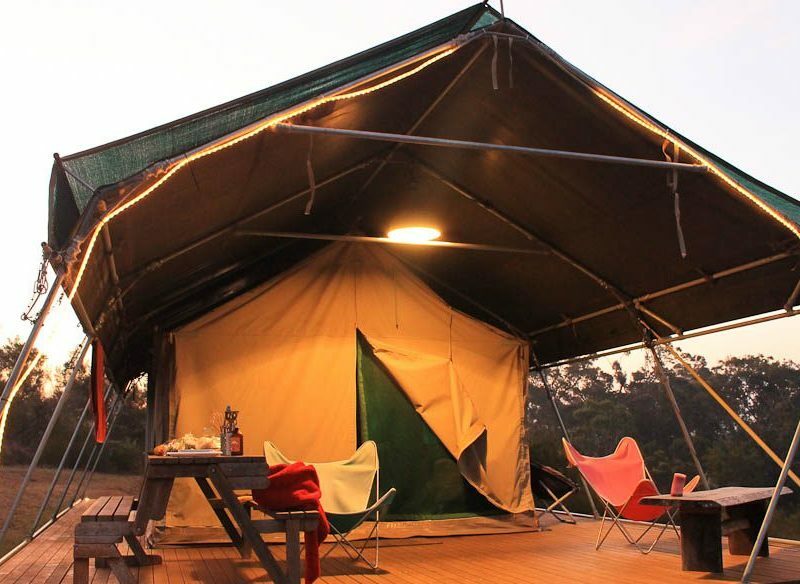 The self-catering safari-style tents at Murrameroo. This might just be the most enjoyable shower I’ve ever had in my life. Warm water is streaming down from the rain shower-head above, washing off the sun-dried salt from my afternoon swim at the deservedly-named Pretty Beach, a short drive from our luxury tent, hidden away in Bawley Point on the private property ‘Murrameroo’. I peer out from an open space between the shower’s corrugated iron wall and the pitched canvas overhead. A symphony of cicadas wafts in on warm breaths of gumtree-scented air as I absorb the panorama of bushland, tinted golden by the setting sun. Beyond lies the ocean, a brushstroke horizon of pinky greys and blues. There is not another soul in sight, besides my husband, who’s gone all Bear Grylls starting a fire out front. Murrameroo is a lot more than just camping. It’s soul-soothingly blissful, yet one thought keeps interrupting my serenity: I should’ve listened to Sandy. When I’d booked this secret getaway through website Airbnb, Sandy, the lovely owner, had gently suggested “there is too much paradise” to fit into a one-night stay. But one night is all we have right now and we’re desperate to ‘go bush’; to swim at the beach, sit by a fire and sleep the sleep of the dead. So, lacking the time, resources or energy for a traditional camping getaway, we’ve decided to try glamping. Glamping – ‘glamorous camping’ – usually involves a permanent tent with creature comforts from electricity and running water, to iPod docks and gourmet dining. It’s not an entirely new concept: Paperbark Camp, arguably the pin-up girl of Australian glamping, is about an hour’s drive north at Jervis Bay; but it’s a trend that has spread from Uluru to Broome’s Eco Beach. Unlike most other offerings, however, Murrameroo is a totally private set-up; just you in your lone tent, on a hill. And this privacy is sacred – guests are asked not to disclose the property’s address or location to others, or on social media. The view at Murrameroo begs you to stay another night. The authentic African safari tent is spacious and shabby-chic, decked out with sitting chairs, patterned rugs, lamps and a comfy bed; shelves are stacked with essentials like extra bedding, crockery and magazines. It’s a self-catered stay, so there’s also a small fridge, toaster and kettle neatly tucked into one corner. A stone-floored en suite lies behind the rear tent zipper, where my shower awaits, along with thoughtful touches from fluffy towels to scented candles. But pride of place is the front deck, perfect for admiring the views from your little patch of hilltop heaven. Down below, the small enclave of Bawley Point has that South Coast magic; a nostalgic beachside escape from holidays past that appears to have been lost in time. Crescents of crowdless white sand hug aquamarine waters, while cow-dotted hills sprawl minutes from the beach with a charming small-town vibe in the air. It’s untamed, yet calm; we spot two enormous stingrays lazily lapping in the shallows at Bawley Beach, where we’re told dolphins and whales are regular visitors, too. Kangaroos roam freely near our tent, while the birdsong soothes or startles, depending on the time of day. The Bawley Beach Café down the road does simple food, really well; we go for corn fritters that pop in the mouth, with poached eggs and bacon. They also do a cracking coffee and milkshakes in classic steel cups. The Merry Street Restaurant comes highly recommended, but we opt to chop mangoes, avos and tomatoes on the deck’s trestle table; cook barramundi over the fire pit and wash it down with white wine, before stargazing as we clutch mugs of tea – from a kettle, not a billy. It’s the perfect blend of comfort and camping, and I desperately wish we had another night here. The aptly named Pretty Beach, not far from Murrameroo. We really, really should have listened to Sandy. The perfect escape for bone-weary city slickers: enough comfort to want for nothing; yet with nothing to distract you from the stunning beauty and stillness of the natural surroundings. The detailed guidebook supplied by our host. From secret beaches to local wildlife and the best artisan bakeries in the area, we felt like we’d been given a magic key to unlocking the best of Bawley. While we were advised to bring all food and drink supplies, basics like olive oil and alfoil would’ve been handy. Shhhh… it’s a secret. But Bawley Point is about 20 minutes’ drive south of Ulladulla, NSW. We paid $170 (plus $20 booking fee) for one night through airbnb.com (just type in ‘Bawley Point glamping’). You’ll receive the contact details and address upon confirmation. All AT reviews are conducted anonymously, and our writers pay their own way – so we experience exactly what you would.